The inside of the new Mission coffee house. It will serve Ritual coffee, which is just down the street. The Mission: This pretty gal above is the latest coffee joint to pop up in the Mission, seemingly out of nowhere. Located on 24th Street, just off the corner of Folsom, it's not completely open yet, though test runs are underway. Apparently, the owner has been very hush-hush about the whole project, even regarding the name. That said, Ritual and De La Paz are supplying the coffee and espresso. 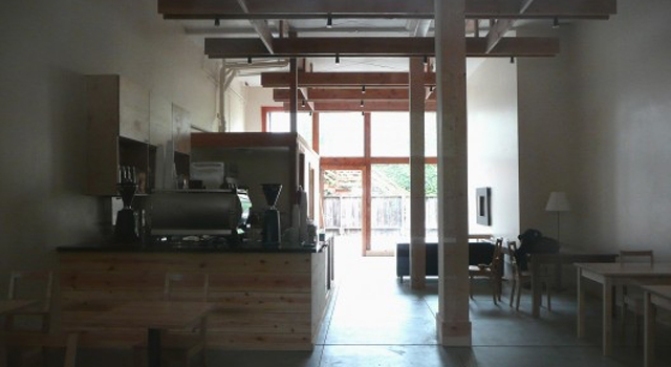 The space, as you can see, an industrial one, almost reminiscent of nearby Coffee Bar and Four Barrel. WiFi will be provided, and there's a patio area in the back too. All in all, just latest ripple on 24th Street, which continues to see many changes.